IS YOUR EVENT AT RISK? The Terranea resort is one of the most successful and expensive hotels in Los Angeles County, yet workers there are not treated with respect. In fact, there is a serious, ongoing labor dispute at the resort as workers fight for a fair process to decide whether to unionize in an atmosphere free from management pressure tactics. 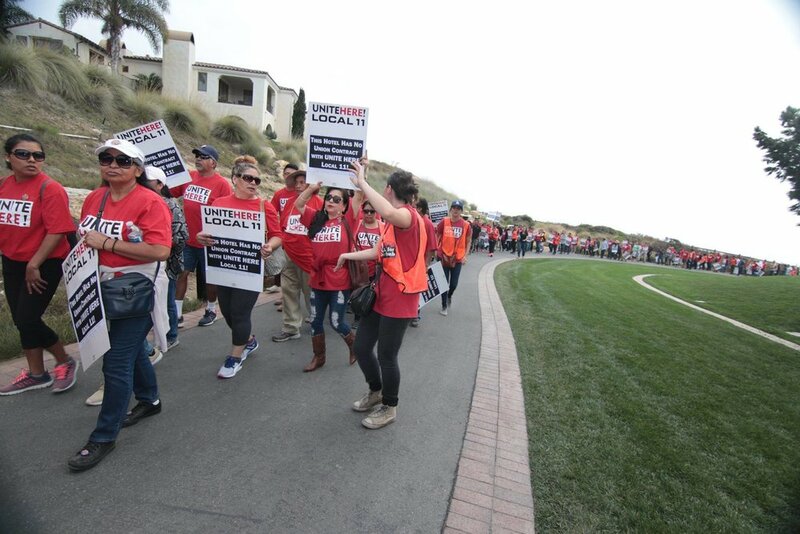 Picket lines, protests, and other activities could disrupt future events at the Terranea as long as this labor dispute lasts. Will you pledge to not eat, meet, or sleep at the Terranea until the labor dispute ends? On December 28, 2018, a regional office of the National Labor Relations Board--an independent agency of the federal government charged with enforcing federal labor law--filed a legal complaint against the operator of the Terranea Resort alleging that it fired worker leader Freddy Lovato because of his activism to improve working conditions at the resort. Terranea Fired Worker Over Some Chicken Wings? The Terranea recently fired Freddy Lovato, a cook at the resort. Freddy is a key leader in the fight for a fair process to organize a union who has even been quoted in the LA Times about conditions at the resort. Terranea managers say they fired him because he didn’t throw away some chicken wings, but workers believe that the real reason Terranea fired Freddy was for his vocal role in the labor dispute. Does firing a worker over some chicken wings sound right to you? On May 31st, 2018 Terranea management settled five separate cases with the NLRB over allegations that Terranea has violated workers’ rights under federal law. As part of the settlement, Terranea will be required to post notices at the workplace notifying employees that in the future Terranea managers will not “threaten employees with calling the police, or in fact call the police to remove or otherwise prevent employees from lawfully distributing union literature” nor “change employees’ work schedules based on whether they support the union or not,” among other commitments. Still, Terranea refused to admit that it did anything wrong under the law. More importantly, Terranea will still not agree to remain neutral as workers decide whether or not they want a union. Time Magazine recognized Sandra Pezqueda as one its People of the Year in 2017 for being a “Silence Breaker.” Sandra is an immigrant mother who washed dishes at the Terranea Resort. After Sandra came forward to report sexual harassment, she was fired. Sandra filed a lawsuit alleging discrimination and retaliation against the Terranea and the staffing agency that placed her there. In April 2018, the staffing agency agreed to pay her $250,000 resolve all claims raised in the lawsuit. knowing all that, Who stays at the terranea? It's not just tourists at the Terranea. Find out about one of the major clients of the Terranea, PricewaterhouseCoopers (PwC) on our website, pricewaterhousebloopers.org.